What an embarrassment for Singapore. How could the powers that be let this happen in public for all the world to see? It was so humiliating. As a Singaporean, I didn’t know who to root for. I was torn by conflicting emotions. Or is it a conflict of interest? On the one hand, country comes first. On the other hand, Argentina was the team we wanted to see at the National Stadium on Tuesday night. Where are the organs of state when you need them? Singapore getting beat up by a foreign power appears to be a recurring theme in the news of late. In this case, some Singaporeans were even rooting for the foreign power as many Singaporean fans wore Argentina colours to the friendly match. And it wasn’t just the spectators. 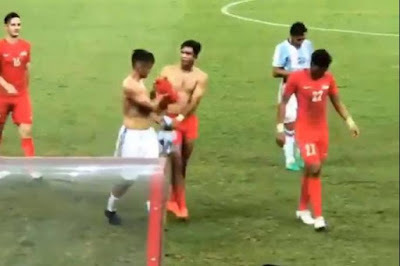 Two Singapore players were spotted asking for the jerseys of two Argentina players as they were walking off the pitch at half-time. 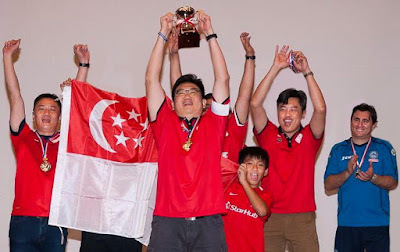 Perhaps the Singapore players wanted to switch teams for the second half. Which is understandable, considering the final result. And the state of Singapore football in general. 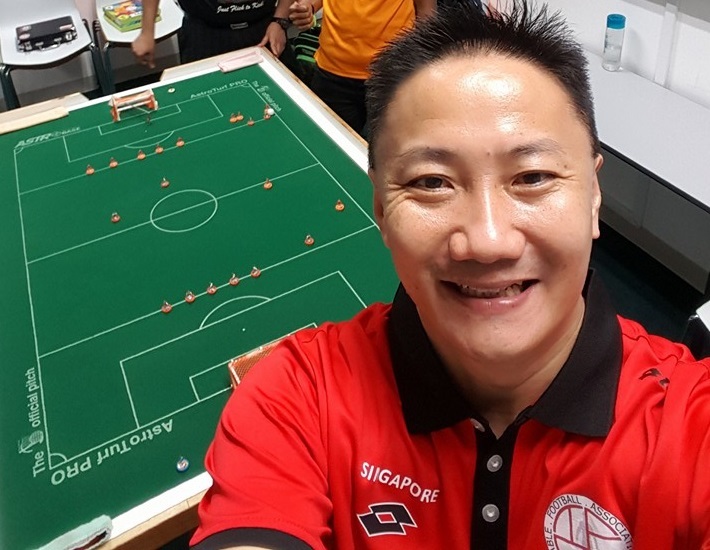 While it may be seen as ironic that the match was organised to commemorate the Football Association of Singapore's 125th anniversary, it’s actually quite fitting as the outcome of the match perfectly illustrates the decrepitude of Singapore football after 125 years. Nobody likes to be on the losing team. But then you gotta dance with the one that brung ya. It’s like when Burger King introduced its Hainanese Tendergrill Chicken and Rendang burgers at the same time recently. As a Hainanese person, I was naturally very excited to finally have a burger named after my dialect. For too long, just as Singaporeans have been enamoured by foreign football teams, we have been slobbering over foreign burgers like McDonald’s Samurai and KFC’s spicy Korean burgers. And don’t get me started on the french fries from France. The problem is, because Burger King introduced the Hainanese and Rendang burgers at the same time, you can’t help but compare the two, therefore pitting brother against brother, I mean, burger against burger. But like Singapore versus Argentina, it was no contest. The Rendang burger is a returning favourite. Burger King even learnt from previous mistakes by leaving out the mayonnaise this time. The Hainanese burger, however, is a new product and, like the Singapore football team, a bit of a disappointment. So, as a Hainanese person, I’m torn by conflicting emotions. Should I remain loyal to the Hainanese burger just because I’m Hainanese? Or should I try to switch teams like those two Argentina jersey-seeking Singapore players and order the Rendang burger because it’s so much better? I will need to form a not-secret ministerial committee to look into this. 1) The FAS is weak and useless . When they sign Sundram before the election , it really speak volume of their capability. 2) Sundram unfortunately is really not up to the mark. He should be sack after the Argentina game. 3) the national players is poor. Lack of creativity, speed, stamina , intelligence . 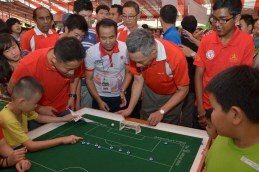 4) singapore should engage a renown coach and his own scouting team. You cannot use our own scout who pick the same type of players that cannot propel Singapore forward. So I had a weird afternoon yesterday. It was a few minutes after 4 o'clock. I was on my way to work and had tapped out at Braddell MRT station. In front of me were three Public Transport Special Command officers. 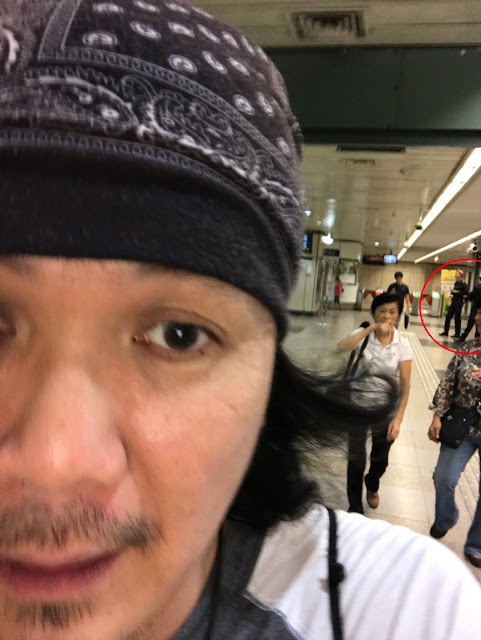 You know, the guys in the grey berets who patrol the MRT? I wondered if the country was on high alert because of the suddenly very public squabble between our prime minister and his sibs. And then I remembered a woman was recently detained for pro-ISIS activities. That could be it. I hoped I wouldn't be stopped because I was late for work. Just as I was about to walk past them, one of the guys stopped me. Just my luck. I took out my earphones to hear what he was saying to me. All he kept saying was “spot check, spot check” as if I was supposed to know what to do. I had never been stopped for a spot check before, so I waited for instructions. Although I instinctively wanted to take out my IC, I wasn't asked to do so yet. Perhaps I sounded a little more insolent than I should. He eventually asked to see my IC, which I handed to him. He then stepped away and I heard him read my name into his walkie-talkie. Meanwhile, I just stood there awkwardly, feeling kinda embarrassed that passers-by must be looking at me and wondering what I did. Was I behaving suspiciously because I was anxious about being late for work? Even though I didn't do anything, I felt guilty for just being stopped. While I was waiting for my IC, one of the other guys asked me where I was going. Eager to clear myself, I said I was late for work and even showed him my work pass. He asked me if I was on the afternoon shift. I said night shift. He said he thought the night shift starts at 7pm. That puzzled me. I was unaware there was some universal definition of “night shift” that states it must start at 7pm. I said my work starts now and ends at midnight. He didn't seem very convinced. It would be just like me to get arrested over semantics. I wanted to take a selfie with them but then thought better of it as I didn't want to get into more trouble and make myself even more late for work. So after I got my IC back and was told I could go, I quickly snapped a selfie with the cops in the background (circled) as I was leaving the station. When I arrived at work, a colleague said I looked even "grungier" than usual. I wondered if that was why I was stopped by police. I headed for the men's room and bumped into a Malay cleaner whom I had never seen before. After leaving the men's room, I bumped into her again. Apropos to nothing, she asked me: "Are you Malay?" What a weird, random question. She said I looked Malay because of what I was wearing on my head. I wanted to say that my complexion is too pale for me to look Malay, but I just smiled weakly at her. It was not the first time I wore the headgear to work. 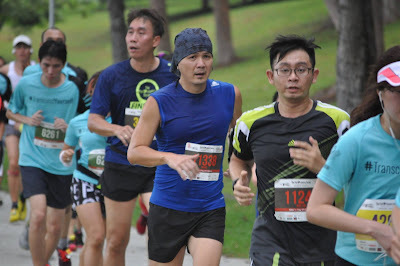 I usually wear it to keep sweat from my face when I'm running , but after my hair grew too long, nowadays I also wear it to keep hair from my face even when I'm not running. You may ask, why don't I just cut my hair? I have explained that in an earlier article. Wait, could that be also why I was stopped by the cops — because I looked Malay? Because of my long hair? And what a weird coincidence that I would have the conversation with the cleaner in the same afternoon. To cap it off, minutes after talking to the cleaner, I found out that I had misread a message from a colleague (the one who called me grungy) and I wasn't supposed to be working that day. It was my day off! So I had rushed to work for nothing. I wasn't late at all. I was stopped by police for nothing. As I shuffled back to the MRT station to go home, feeling like an idiot, I realised the three TransCom officers could still be there. If they see me again, they would think I had lied to them about going to work after all that discussion about "night shift" and me working until midnight. How was I going to explain myself? To my relief, when I reached the MRT station, the cops weren't there any more because even I couldn't be that unlucky. 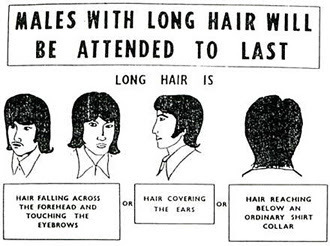 Perhaps it's time I get a haircut. Well, it should. Last week, because of Facebook, I learned about issues of racism, ageism and foodism. No, I didn’t make up that last word. Unlike "covfefe", "foodism" is a legit word in the Oxford English Dictionary along with "aiyah" and "aiyoh". As in, aiyoh, did you read what happened to that Indian actor who complained on Facebook about being asked to speak like "a full-blown Indian man" during an audition for the Ah Boys To Men movie sequel (yes, another one)? Mr Shrey Bhargava’s Facebook post went viral and many people supported him, but many also whacked him worse than critics whacking the Ah Boys To Men movies. Things escalated quickly when he was questioned by the police at Tanglin Police Division on Wednesday because someone made a police report. Yes, someone actually made a police report over this because, you know, Singaporeans. But the police said they have "assessed that no criminal offence was disclosed" and they "will not be conducting further investigations in relation to the case". Yah lor, the police have better things to do. Like investigating unattended bags at the MRT station left by two dudes who had to go answer the call of nature. At least Mr Bhargava wasn’t called "sick in the head", "self-centred" and "smug" by Home Affairs and Law Minister K. Shanmugam because of his Facebook post. That was what happened to a Mr Thomas Chua who wrote a "gloating post" about the death of a Traffic Police officer and angered Mr Shanmugam so much that the minister identified Mr Chua by name and posted his picture on the minister’s official Facebook page. I’m not sure which is worse — being questioned by the police or being shamed by the Minister of Home Affairs and Law on social media. At least Mr Bhargava is still on Facebook whereas Mr Chua isn’t. The latter is too busy getting arrested for shoplifting. Also, Mr Bhargava, 22, is still young and has a whole career ahead of him unlike, say, 70-year-old TV actress Jin Yinji. In a newspaper interview, she said she was shown no respect during contract talks with Mediacorp last year and has since left the company. I wonder if she was asked to speak like a full-blown Chinese woman. Probably not. Nowadays, it seems only Jack Neo is asked to do that. When he’s not busy perpetuating racial stereotypes, the director of the Ah Boys To Men movies also cross-dresses as Liang Ximei in Happy Can Already!, a Hokkien TV series promoted by the Government. Speaking of questionable sexuality, I also read on Facebook that multi-coloured cake is gay. "Went to another of those ‘young punk’ cafes that are sprouting all over our island, and again saw all these so-called ‘rainbow cakes’. 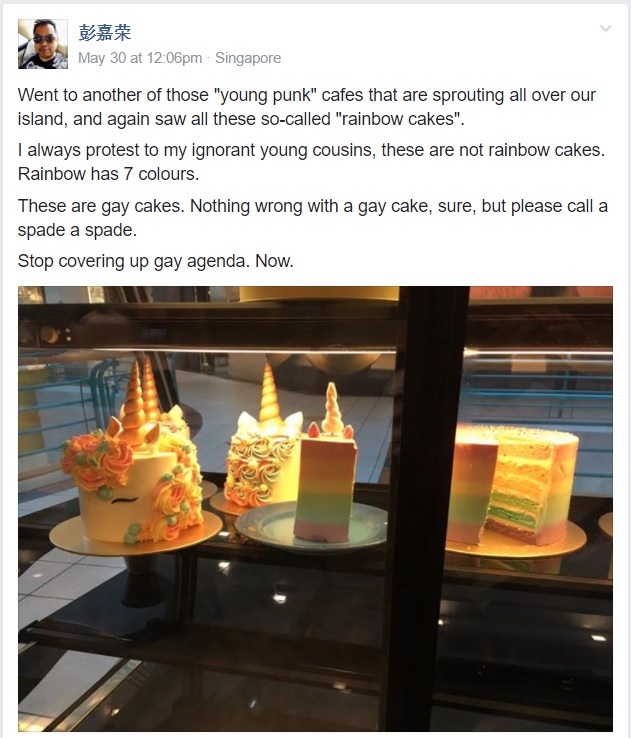 "I always protest to my ignorant young cousins, these are not rainbow cakes. Rainbow has seven colours. "These are gay cakes. Nothing wrong with a gay cake, sure, but please call a spade a spade. "Stop covering up gay agenda. Now." The post went viral last week too. Before long, there will be erections of barricades around these baked goods and only Singaporeans and permanent residents will be allowed to enjoy them. In Taiwan, the law would be changed to allow these cakes to marry each other. After all, they didn’t choose to be gay. They were baked that way. Hey, isn’t that a Lady Agar Agar song? If you want to be outraged by food, it should be cheese tea. I mean, what the hell is it? Do you drink it or dip nachos in it? For just as we should guard against racism and ageism, we should also not discriminate against so-called "rainbow cake" with colours in numbers other than seven because that’s homophobia. If I post that on Facebook, please don’t make a police report, okay?